Featured, key leaders and most of the new members of Hive Effect, an entrepreneur development initiative created by the Edinburg Economic Development Corporation, following their orientation session on Wednesday, August 23, 2017, at the offices of Grindstone Coworking, located at 506 West University Drive. From left, front row, are: José Chávez; Gerardo González; Donica Landa; Renee Sánchez; and Dani Marrero. From left, back row: Cooper Thompson; Steven De Los Santos; Agustín García, Executive Director, Edinburg Economic Development Corporation; Daniel Rivera, Founder, Grindstone Coworking and Director of Hive Effect in Edinburg; Elizabeth Martínez; Marco Barrios-Espinoza; Mark Laguñez; Pete Díaz; and Cirano Lagunas. Not shown in this image are Noé Ramos, Mark Harris, and Mauricio Atilano. 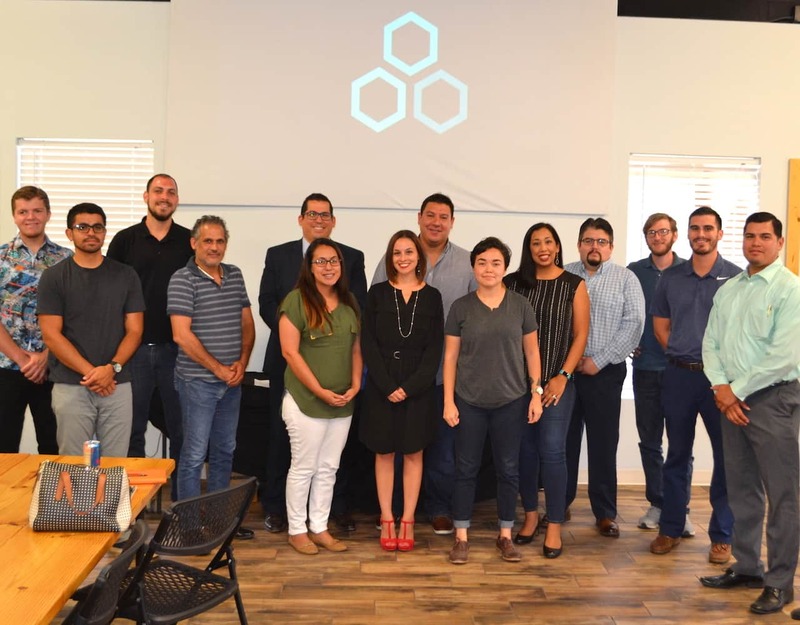 The Edinburg Economic Development Corporation, in collaboration with Grindstone Coworking, has announced the second cohort (new set of members) of the Hive Effect, which is an innovative entrepreneur development initiative designed to help local businesses, particularly small firms and sole proprietors, to succeed and prosper. According to its website (http://hiveeffect.com/about-us/): Hive Effect uses a three-pronged approach to cultivate the entrepreneurial ecosystem and promote regional collaboration. It utilizes coworking, education, and mentorship to help both startups and existing businesses; Hive Effect conducts a six-month education program called the Hive Effect Learning Program (HELP). Applications for HELP are reviewed for acceptance twice each year to select cohort participants. Hive Effect partners with local and regional entrepreneurial organizations and businesses with programs and events that aim to grow the entrepreneurial ecosystem across the Rio Grande Valley; and Grindstone Coworking, located at 506 West University Drive, is a membership-based office in Edinburg. Designed for mobile workers, freelancers, and startups, the office provides workspace, phone booths, private suites, conference rooms, training rooms, a copy center, mailboxes and other amenities for today’s modern businesses. “The EDC is excited to again partner up with Grindstone Coworking to promote this second, six-month initiative,” said Agustín García, Executive Director, Edinburg Economic Development Corporation. “Hive Effect has become a valuable resource for some of our city’s most exciting new businesses.” Daniel Rivera, founder of Grindstone Coworking and Director of Hive Effect, added: “We’re proud of what we’ve accomplished with Hive Effect since its launch in September 2016. Our coursework, mentorship and implementation of the coworking concept last year helped 10 entrepreneurs achieve great things for their respective businesses, and we’re happy to announce our second cohort (new set of members) of 15 individuals to our growing community.” The Edinburg EDC is the jobs-creation arm of the Edinburg Mayor and Edinburg City Council, which includes Mayor Pro Tem J.R. Betancourt, Councilmember Homer Jasso, Jr. Councilmember Richard Molina, and Councilmember David Torres. The Edinburg EDC Board of Directors is comprised Mayor Richard García as President, Harvey Rodríguez, Jr. as Vice President, Elías Longoria, Jr. as Secretary/Treasurer, and Richard Rupert and Dr. Peter Dabrowski as Members. Mayor Richard García and Edinburg EDC Executive Agustín García are not related. The Edinburg Economic Development Corporation, in collaboration with Grindstone Coworking, has announced the second cohort (new set of members), of 15 individuals, for Hive Effect, which is an innovative entrepreneur development initiative designed to help local businesses, particularly small firms and sole proprietors, to succeed and prosper. • Hive Effect conducts a six-month education program called the Hive Effect Learning Program (HELP). Applications for HELP are reviewed for acceptance twice each year to select cohort participants. • Grindstone Coworking, located at 506 West University Drive, is a membership-based office in Edinburg. Designed for mobile workers, freelancers, and startups, the office provides workspace, phone booths, private suites, conference rooms, training rooms, a copy center, mailboxes and other amenities for today’s modern businesses. The Edinburg EDC is the jobs-creation arm of the Edinburg Mayor and Edinburg City Council, which includes Mayor Pro Tem J.R. Betancourt, Councilmember Homer Jasso, Jr. Councilmember Richard Molina, and Councilmember David Torres. The Edinburg EDC Board of Directors is comprised Mayor Richard García as President, Harvey Rodríguez, Jr. as Vice President, Elías Longoria, Jr. as Secretary/Treasurer, and Richard Rupert and Dr. Peter Dabrowski as Members. Mayor Richard García and Edinburg EDC Executive Director Agustín García are not related. Among its other key duties, the Edinburg EDC serves local companies by providing assistance with expansion plans, programs to help retain business, and advocating for policies that enhance the region’s economic competitiveness. Rivera, in a recent interview conducted by the Edinburg Review’s Karen González, said Hive Effect is based on an entrepreneurial approach to economic development known as “economic gardening”. The University of Texas Rio Grande Valley celebrated its second birthday Wednesday, August 31, 2017 with cupcakes, free T-shirt giveaways and the unveiling of its strategic plan that will chart the course of the university’s future. The Edinburg Mayor, Edinburg City Council, and the Edinburg Economic Development Corporation and its Board of Directors lobby the Texas Legislature and the UT System Board of Regents on behalf of UTRGV, particularly for its main university campus and School of Medicine campus in Edinburg. Students, faculty and staff poured into the University Ballroom in Edinburg and PlainsCapital Bank El Gran Salón in Brownsville to cheer the university’s successes and learn what UTRGV is doing to advance educational, research and health and medical opportunities for its students. UTRGV President Guy Bailey lauded the university’s accomplishments, including graduating more than 10,000 students since opening its doors in 2015, and having more students taking 15 student credit hours or more, which will allow them to graduate earlier. He also told the crowd about new academic opportunities the university is developing for students, such as offering a doctoral degree in physical therapy and expanding its Physician Assistant Studies Program. Expanding opportunities for students is part of UTRGV’s strategic plan, which will serve as a roadmap for where the university needs to go to ensure student success, Bailey said. University officials have spent more than a year developing the plan, receiving substantial input from students, faculty, staff and the community-at-large, said Dr. Patricia Álvarez-McHatton, Interim Provost and Vice President for Academic Affairs. The plan revolves around the core priorities of educational opportunities, health and medical education, research that benefits the Valley and beyond, and community engagement. Those four all center on the main priority – student success. Other initiatives listed in the plan include building UTRGV to become a bilingual, bicultural and biliterate university, and providing more professional development opportunities for faculty, students and staff. McHatton said the strategic plan highlights much of what the university is already doing to ensure that students and the university as a whole succeed, but it also holds the university accountable by establishing evaluation metrics to track progress in meeting those goals. It will take the support and commitment from the entire university and community to make this plan work, she said. Peter Averack, Vice President of UTRGV’s Student Government Association, echoed McHatton’s call for teamwork to make the university’s strategic plan goals a reality. One of those students, Sofia Rodríguez, a senior nursing major from Brownsville, was happy to take time out of a busy schedule to attend the celebration. Alejandro Hernández, a senior biomedical major from Monterrey, Nuevo León, Mexico, said UTRGV Day was a great way to raise school spirit and morale. Read more about UTRGV’s Strategic Plan at http://www.utrgv.edu/spc.